A rezoning request for 490 Huron Parkway from R3 (townhouse district) to R1B (single-family dwelling) has received initial approval from the Ann Arbor city council. The action came on May 13, 2103 at a meeting that had started on May 6. Aerial view of 490 Huron Parkway, outlined in black. The major road running west of the site is Huron Parkway. The land on the far west of this image is the site of Huron High School. 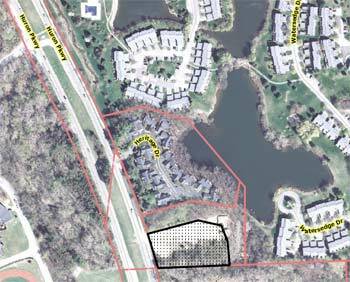 If given final approval at a subsequent council meeting, following a public hearing, the rezoning would allow the currently vacant 1.22-acre site, located north of Ruthven Park, to be divided into three separate lots. City planning staff had recommended the rezoning, and noted that the adjacent parcel at 500 Huron Parkway is also zoned R1B. However, the proposal did not win approval from the city planning commission at its Dec. 18, 2012 meeting. At that meeting, planning commissioner Bonnie Bona said she couldn’t support the rezoning. With 70,000 people commuting into Ann Arbor each day, it didn’t make sense to build single-family homes in that area. “Single-family homes should be built in townships, where they don’t want bus service,” she said. Only six of nine commissioners were present – and because a rezoning needs six votes to achieve a recommendation of approval, the request received a denial.